Has your address been changed recently? Are you looking out for way through which you could get your address updated in your HDFC Bank Account? If yes, then you have landed on the correct page. In this modern age getting address updated in your HDFC Bank Account is very simple task, and also there are several ways available through which you can get your address updated in your Bank Account. But the only requirement stays intact to update your address with HDFC Bank Account is valid address proof document, without address proof document you cannot get your address updated in your bank. If you have any one of the above mentioned address proof document, then you can easily get your address updated or changed in your HDFC Bank Account. Below is the complete process which explains you on How to Change Address in HDFC Bank Account via online method or by visiting the branch. Now you change or update your address in HDFC Bank Account Online via Internet banking without visiting the branch, this method will save lot of time and energy which you would have wasted by visiting the branch and waiting there. Online process is very simple and it almost takes 1 -2 working days to get your details updated in your bank once verification is done by the bank. So let’s proceed with the steps on How to Change Address in HDFC Bank Account Online via HDFC Bank Net Banking. 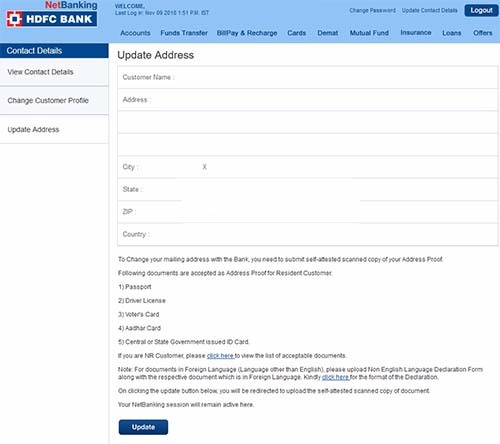 To submit address change request online for your HDFC Bank you should have internet banking activated, and if still you don’t have this service then you can get it activated instantly by following our article how to register for HDFC Bank Internet Banking. Login into your HDFC Bank Internet Banking Account by entering your customer ID and password. Once you are logged in, just click on update contact details. A new page will open which will display your contact details, so to update your address just click on update address option which is listed on left hand side. On clicking update address, a new page will open which will display your existing address. To submit address update request just slick on update button which is present below. Next page will be address change screen, which will preload few details like your customer Id, full name, last four digits of account number, and existing address. So to make the change to the address just enter your new address in the field, but make sure you enter the same address which is present in your address proof document or else the request would get rejected for mismatch reason. Once entering the complete address, make sure you have scanned copy of above mentioned any one of address proof document on your pc or laptop. Select the address proof from the list which you would be uploading and add the scanned copy of document and click on upload button. Once the document successfully gets uploaded, solve the captcha code, accept the terms and conditions and click on submit button. Upon verification of your submitted documents, your address will get changed in your HDFC Bank Account and you will also receive SMS from HDFC Bank once this change takes place successfully. 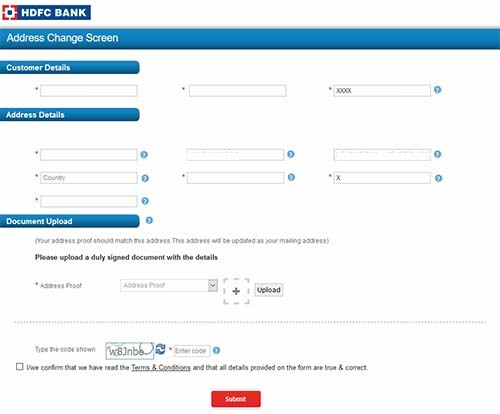 That’s it this is how one can easily update their address in HDFC Bank Account via Internet banking. If you are not familiar with the online method of updating address in your HDFC Bank, then you can always opt for the traditional method which is by branch. To update your address from branch first of all you will have to take any one address proof document which we have mentioned above, with your bank account number. Visit the branch and ask for Address Update Application Form. Fill up the address update application form, enclose the address proof documents and submit it to the branch. Once submitting the application it would be verified and further processed which will take almost 4 -7 working days. Once your address gets updated in your HDFC Bank Account, you will be also notified via SMS.